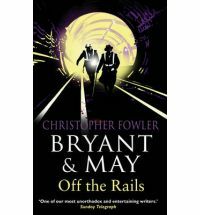 Bryant & May Off the Rails by Christopher Fowler, the 8th and latest mystery in the brilliant series, follows on straight after the events in Bryant & May on the Loose. The detectives are hot on the trail of the elusive Mr. Fox who has just recently escaped from custody and killed a policeman in the process. Except he’s disappeared off the face of the earth and Bryant & May are baffled. No one can remember what this Mr. Fox looks like. He can disappear at will into the busy areas of King’s Cross like a trace of smoke leaving behind nothing. As usual, the detectives in the Peculiar Crimes Unit (PCU) are battling the closure of their eccentric unit which has been given a short reprieve and has now moved to an abandoned warehouse whilst mourning the death of their colleague. They are determined to capture the elusive killer who is becoming more and more unpredictable as the corpses pile up. Can they catch slippery Mr. Fox whose face no one can recall before the PCU is shut down and he kills again? And what of the group of socially awkward UCL students living in Mecklenburgh Square who seem to be up to something dodgy? I think one of the things I love about the Bryant & May series is the gentle humour threaded throughout the tale. There is a lot of affection for the characters plus a lot of insider info about London and, in this book, King’s Cross and its neighbour Bloomsbury (with references to UCL and Mecklenburgh Square – my university haunts). There is an old world, almost golden age, feel about the two detectives, but they are firmly entrenched in the 21st century which can sometimes jolt you out of your reveries with references to flash mobs and e-mails, although I think Fowler does this rather successfully. And apart from Bryant & May, who I love, I also have soft spots for all the other detectives, especially DS Janice Longbright with the platinum curls, curvy body and killer heels. As usual, may I direct you to the first book in the series, Full Dark House, before you go on to enjoy the rest? I promise you won’t regret it. Adding Full Dark House to my wishlist. This sounds like a series I could really love. I am very tempted by this. I haven’t read any of them, so I will take your advice and start with Full Dark House. Um, how have I never heard of this series?!? It sounds wonderful and like exactly the kind of crime/mystery novel I love best! I will be keeping my eyes peeled for Full Dark House! I own the first few books of the series but haven’t started it yet. I know that I will probably devour it once I start so I wanted to wait until I had some other series out of the way. I doubt I’ll be able to wait much longer though! I’ve just bought the first three from the Book people, so looking forward to getting stuck in sometime soon. They sound really fun.